Directions to Kever: It is assumed that the Rav was buried somewhere in or near Chicago as that's where he died. Please help us find his kever, any information is appreciated. 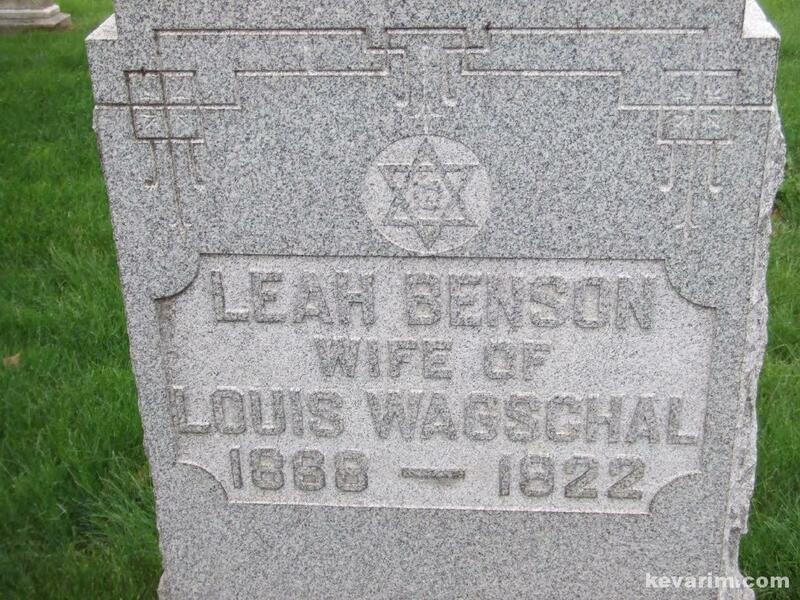 Name Listed on Cemetery Database: Mystery !!!!!!! A SPECIAL THANKS TO THE MEMBERS OF MORESHES CHACHMEI AMERICA, MR. ASHLEY DWORSKY, & RABBI JOSEPH SCHANOWITZ OF CHICAGO FOR THEIR COUNTLESS HOURS OF RESEARCH IN THE ONGOING SEARCH TO LOCATE RAV AARONSOHN’S KEVER. 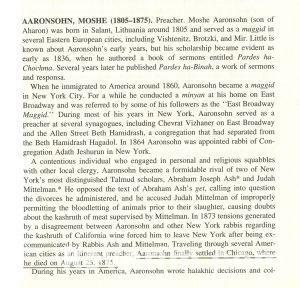 Rav Aaronsohn was born in 1805 and served as a maggid (preacher) in several Eastern European towns among them Mir before arriving in New York in 1860. The Rav arrived on these shores form Liverpool, England on September 19, 1861 aboard the Kangaroo Steamship as “Moses Gadskinck”. 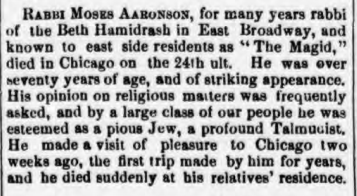 In 1864 he was appointed rabbi of Congregation Adath Jeshurun in New York City. 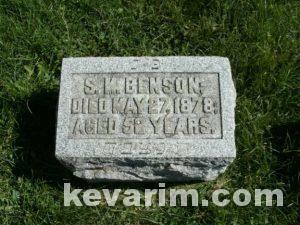 He eventually settled in Chicago where he passed away on September 24, 1875 (not on August 25 of that year). Among the Rav’s printed seforim is Pardes ha-Chochma, Pardes ha-Bina, and Mattei Moshe. Of the Rabbi’s known relatives was his wife Libbie, who moved to Jerusalem and is buried at the Mount of Olives Cemetery. 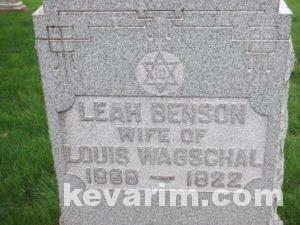 His daughter Sarah (d. April 1905) lived in New York City and was married to Raphael Leib Mandelbaum (d. April 1897). Both are interred at Bayside along Pitkin Avenue in Queens. They had a son named Isaac, who is mentioned in the Rav’s will. 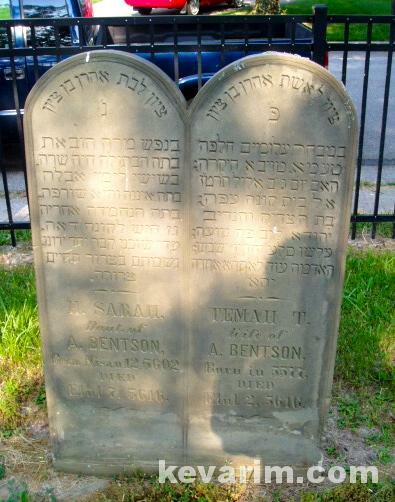 The Rav’s oldest son Aaron Ben Tzion Bentson lived in Marion, Indiana. 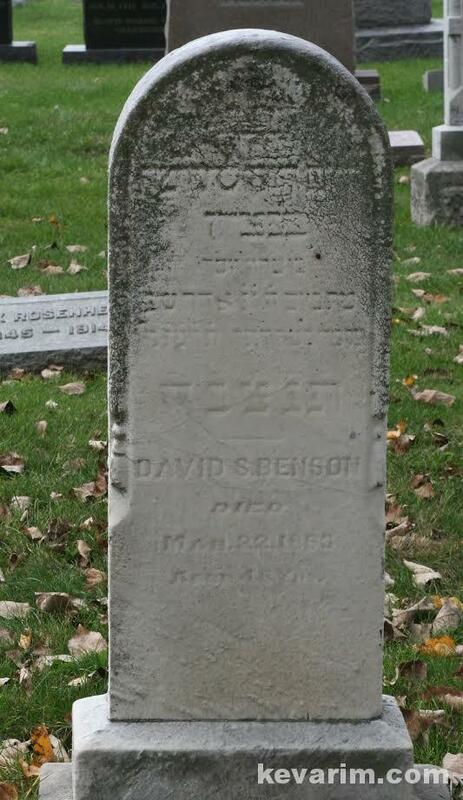 Another son David S. Benson (d. 1833), a carriage trimmer who lived in Indianapolis is buried at Indianapolis Hebrew Congregation Cemetery South. One, Michael (M.S.) 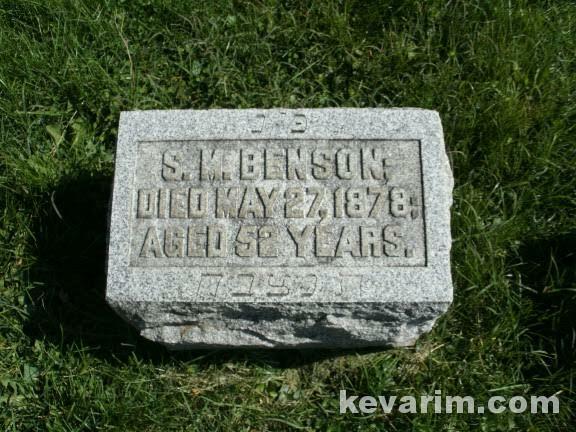 Benson was married to Esther (interment: Springdale Cemetery, Madison, Indiana) they had two children Joseph M and Dora. 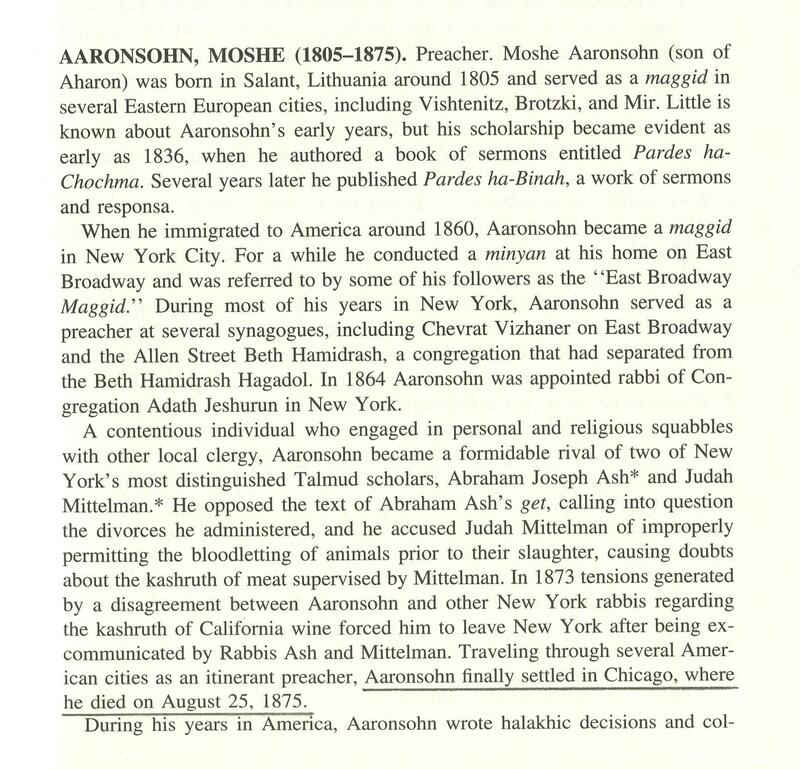 Credit: Moreshes Chachmei America’s Archives OF NOTE: Rav Aaronsohn was also known as Rav Moshe Salanter. 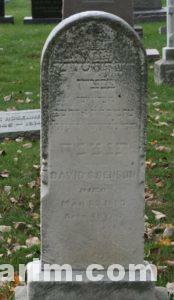 Photo Caption: The Rav’s grandson (along with other family members) buried at Springdale Cemetery in Madison, Indiana. 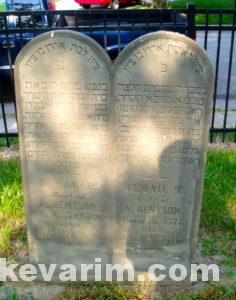 Do you know if the Rav had a shule in Chicago? His full name was Rav Yosef Mosh aaronsohn. 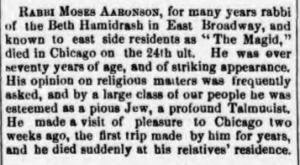 The sefer Matai Moshe was printed in Israel after his death, in the preface is is mentioned that he only went to Chicago (סאגאגא) on his way to Israel which never developed since he was niftar there in 25 Elul 5635 (Baruch, check the date). His other two seforim; Pardes Hachuchma and Pardes Habina are also on Hebrew Books, one was printed 5596 and the other one 5602, both prior to his coming to the US. The entire Sefer Matai Moshe is very intresting, it is the first Sefer written in the US to be printed in Israel, the first part is Derushim and the second half includes letters and responsa. Rav Ahronson is known for his disputes with Rav Asch and Reb Yehuda Mittelman on Schechita matters, he has letters from European Gedolim such as R’ SR Hirsch of Franfurt and RS Kluger of Brody as well as the Jeruslem Bes Din, to his side. On page 142 (on hebrew books) he lists the names of those Rabbionim and mentions that the letters are available by his son Shmuel Yechiel who resides in Madison, Indiana by the name S. Ch. Benson. Page 154; a response to the Kehila in Baltimore MD about a Sefer Torah that RCH”L fell down. P. 164; an open letter about the Gittin situation in the US, very interesting. His father was known as Reb Ahron Salanter, Reb Moshe served as rav in a few Polish villages prior to his coming to the US.